In Part II of my intro to Don Quixote, I will cover some of the themes and “illusions” that make the novel so unique. The historical context within which the work takes place is significant in understanding that appearances cannot be trusted. Even the novel itself suffers from an unreliable authorship as I will explain. So, since things are not as they appear, the key is attempting to look beyond the surface to what is really happening. For instance, the Edict of Exile of 1492 banished from Spain all Jews unwilling to convert to Catholicism and the Edict of 1499 effectually did the same to Muslims. Thus, both Jews and Muslims who chose to remain in Spain, did so only as conversos or Morenos. In reality, most of them kept faith with the religion of their fathers, but in public appeared as Catholics. This made for confusing cultural dynamics which Cervantes alludes to in humorous ways. 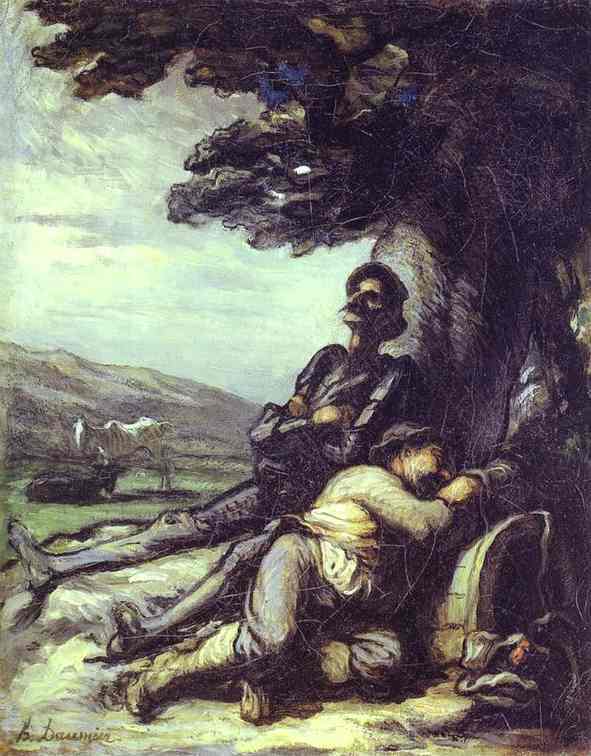 In regards to the authorship of Don Quixote, (Part I, Chapters 8-9) Cervantes sets up a complex literary conceit by claiming that the story of DQ ends abruptly and that he is at a loss as to where to find the “rest of the story.” But as he was walking one day “on the exchange of Toledo” he runs across a boy selling old papers with Arabic writing on them. Now this is significant, since during the Inquisition of Ferdinand and Isabella, both Hebrew and Arabic were outlawed. Books in these languages were burned (thus the scene of the book burning which opens the novel), and though Arabic had been the lingua franca during the Golden Age of Spain, it had now been outlawed for nearly a century and no one spoke it openly any longer. So while Cervantes knows the Arabic script, he is unable to read it. He therefore finds a “Moorish rabbi to read them” and low and behold, this is the very story of Don Quixote of La Mancha! There are so many things going on in this scene that it is difficult to cover them all. First of all, Toledo was the center of the intellectual renaissance in Spain. It was there, that Brother Raymund de Sauvetot began his school of translation in the 12th century that brought together Arabic, Jewish, and Christian scholars to translate the classic works of Greek antiquity into Latin, Hebrew and Arabic from the original Greek. The Arab scholars brought the works of Persian authors in mathematics, science and medicine to be translated from Arabic into Latin. These three Abrahamic faiths worked side by side in tolerance and mutual respect. Now in the scene depicted by Cervantes, Toledo is nearly bereft of anyone who even speaks Arabic and the Golden Era of Spain is at an end. Not only that, but many of the texts painstakingly translated during this Golden Era were systematically burned on Inquisitional fires. In the novel when the “Moorish rabbi” begins to read the text, he bursts out laughing because of notes written upon the margin. Cervantes questions him and he says, “This Dulcinea del Toboso [DQ’s lady love], so often mentioned in this history, had, they say, the best hand at salting pork of any woman in La Mancha” (68). The reason the Arab is laughing is because Dulcinea must have been a secret Jew, as Jews were forever trying to prove their authenticity as conversos by their willingness to handle pork, and become quite skilled at it. as Cervantes notes, “if any objection lies against the truth of this history, it can only be, that the author was an Arab, those of that nation being not a little addicted to lying” (69). So even while he lays out the complex way in which the story of DQ comes to light, (by way of proving its veracity) at the same time he calls into question the reliability of the text by virtue of the fact that Arabs are somewhat known for their lack of honesty. Miguel de Unamuno says of Don Quixote’s loss of his wits: “He lost them for our sake, for our benefit, so as to leave us an eternal example of spiritual generosity”. That is to say, Don Quixote goes mad as a vicarious atonement for our drabness, our ungenerous dearth of imagination” (Bloom 150). Enjoy this novel for the ways in which it can deliver us from our lack of imagination, our spiritual drabness and selfishness, and be inspired, like Don Quixote (as crazy as it may seem) to live life with joy, inspiration, imagination, and even a bit of foolishness. Don’t forget to check out The Man of La Mancha with Peter O’Toole and Sophia Loren. Please preview before watching as a family. 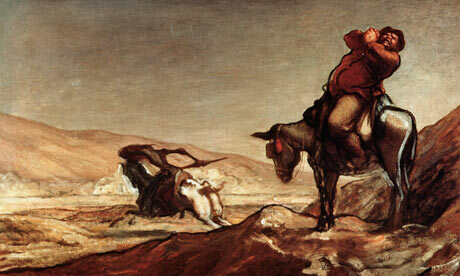 A number of artists have depicted Cervantes’s work with beautiful imagination. Don’t miss the woodcut etchings of Gustave Doré (featured in my last post) and also the oil paintings of Honoré Daumier. Also check online for images of the memorial sculpture in Madrid that honors Cervantes and his immortal characters from Don Quixote.